In recent years, an increasing number of Chinese young people have chosen a "naked marriage." The term refers to a couple who get hitched without any major assets and who spend little on their wedding ceremony. Without expensive preparation and rituals, Wang Shaowei and Zhang Xin tied the knot at a cost of nine yuan, which was used to obtain the marriage certificate. The couple, who just entered the work force and had learned to be self-reliant, did away with nearly all the traditional "must-haves" for a Chinese wedding: owning an apartment, a car, wedding rings as well as holding an expensive ceremony. "We had a big dinner in our two-bedroom rented apartment to celebrate the start of our married life, and nothing else," said the 26-year-old Wang, who lives with his wife in Shijiazhuang, capital city of the northern Hebei Province. The "naked marriage" is in sharp contradiction with China's established marriage customs, which encourage parents to help lay the material foundation for their children's marriage. According to a poll conducted by the social investigation center of the China Youth Daily prior to this year's Chinese Valentine's Day, Qixi Festival that fell on last Saturday, nearly 48 percent of 3,214 respondents said they supported the idea of "naked marriages," while about 23 percent opposed it. The vote also showed that about 55 percent of the respondents viewed courage as essential when engaging in a "naked marriage" and 43 percent of them agreed that married life of the couple who had a "naked marriage" would be much tougher than their peers with better financial status. 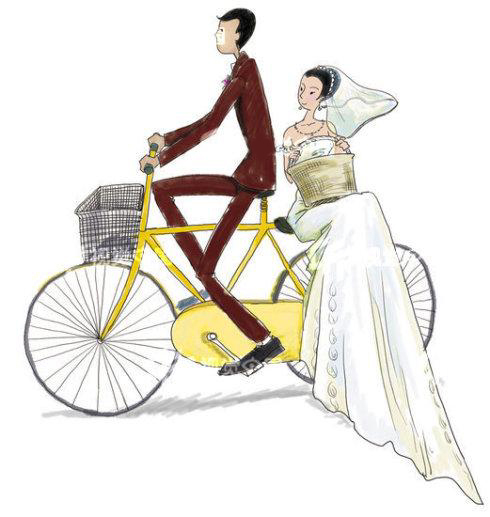 "Compared with my peers who had everything when being married, my marriage seems a bit of `shabby.` But we've been together for eight years, and I think the foundation of marriage is love, rather than money," said one of the approvers, Wang Haimin, a PhD candidate in Beijing. Wang and her husband, an employee with a foreign company, are still living in a rented home two years after getting married. "If a couple has had everything when they get married, what should they expect in the future? I think the most joyful part about marriage is that two people work hard to achieve every goal of life together," read a post on the BBS of the popular web portal of Sina. Nevertheless, some objectors believe, as the Chinese proverb goes, "Everything goes wrong for the poor couple." "Frictions will be generated if the newlyweds have to struggle to make ends meet every day," posted Sina user "Wolongcha." "The ideal life for Chinese is to live and work in peace and contentment. The marriage without a solid material foundation is unstable," said Wang Shuqin, a 50-year-old resident of Shijiazhuang. Although the traditional marital values are still deep-rooted in Chinese people`s mind, experts said the increasing acceptance of "naked marriage" showed a more open-minded attitude of the youth. Why remaking TV classics stinks?